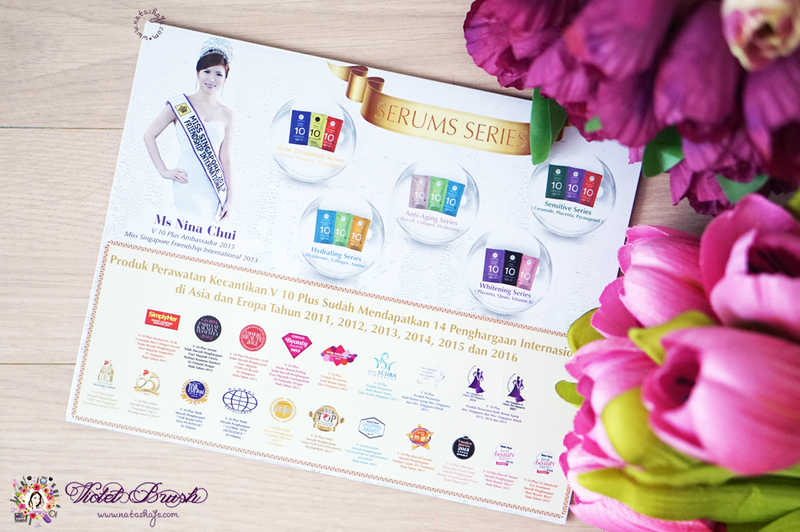 V10 Plus Serums are made without paraben, artificial coloring, mineral oils, and artificial fragrance. V10 Plus Serums are water-based and dermatologically tested. V10 Plus Serums are available in several packages, each contains three types of different serums. There are Acne Treatment Series (Licorice, Vitamin C, Pycnogenol), Hydrating Series (Hyaluronic Acid, Collagen, Amino), Anti-Aging Series (Biocell, Collagen, Hyaluronic Acid), Whitening Series (Placenta, Quasi, Vitamin A), and Sensitive Series (Ceramide, Placenta, Pycnogenol). Quasi Serum - brightens the skin tone. Ceramide Serum - for dry and sensitive skin. Vitamin C Serum - for troubled skin (acne), minimizes the pores. Vitamin A Serum - for metabolism and dark circles. Biocell Serum - for DNA reparation, regeneration of skin cells, anti-wrinkles, and prevent the production of melanin. Hyaluronic Acid Serum - moisturizes the inner layer of the skin. 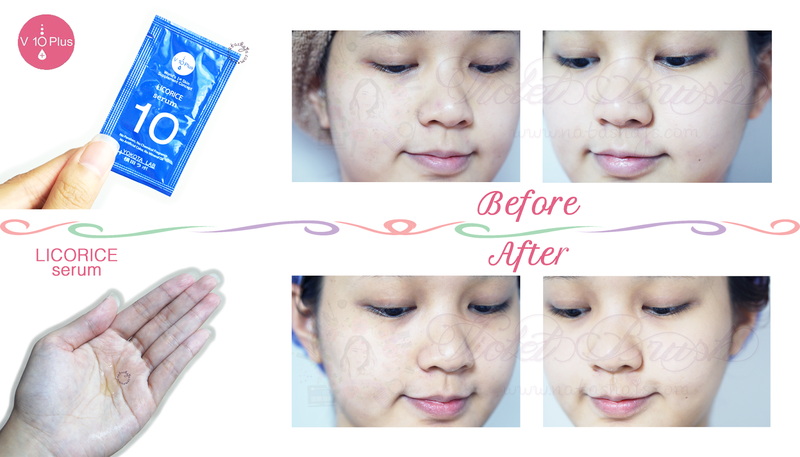 Placenta Serum - for skin whitening. Licorice Serum - for skin irritation and skin inflammation. Amino Serum - moisturizes the outer layer of the skin. Collagen Serum - for skin's elasticity and reduces wrinkles. V10 Plus sent me a package of the Acne Treatment Series and Water-Based Peeling (which I will re-review on my next post). I'm kinda confused why I was sent Acne Treatment Series when my skin is certainly not an acne-prone and troubled skin. 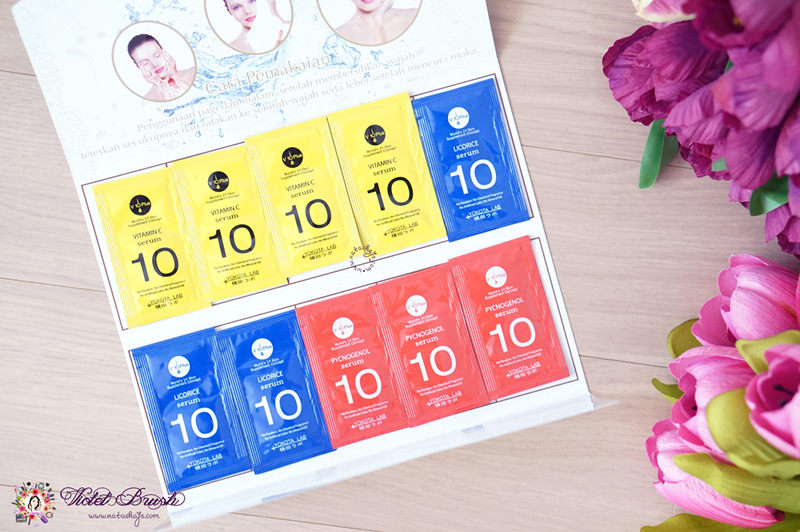 On the contrary, I think that the Hydrating Series or Whitening Series would suit my dehydrated skin better. Nonetheless, here are my verdicts. It is recommended to use the serums altogether but I decided to use it separately to see how each works on my skin. 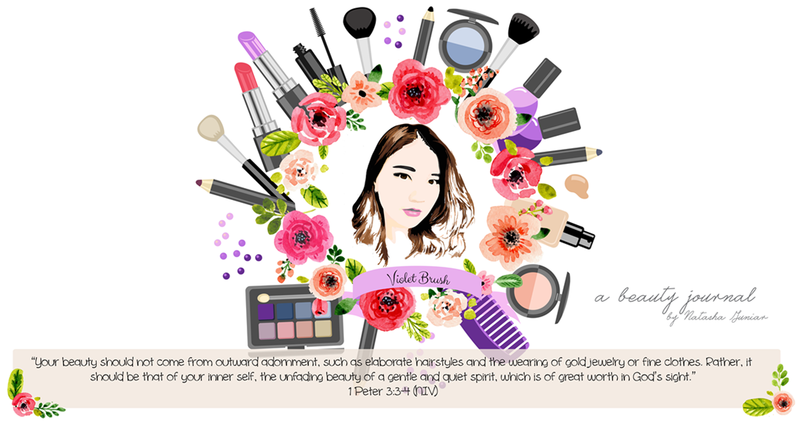 Previously on my other post, I told you that my skin is pretty sensitive that it gets red whenever I use something too rich on my face too often. So instead of using these serums twice a day, I only use it once at night. The first one I tried was the Vitamin C Serum. First of all, I'm not a fan of its scent. The Vitamin C Serum smells like medicine, seriously, and out of the three, it has the lightest texture, almost transparent in color and feels like water on my skin. 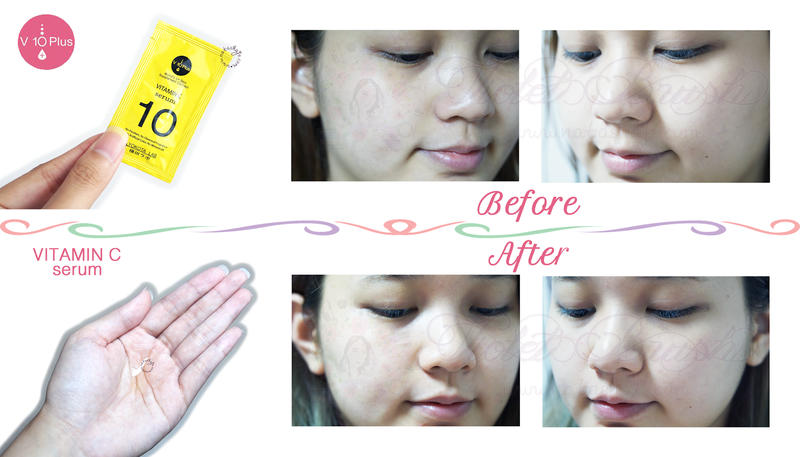 V10 Plus claimed that this Vitamin C Serum is created for troubled skin and to minimize the pores. Since I don't have a troubled skin, I can't say anything on point one. 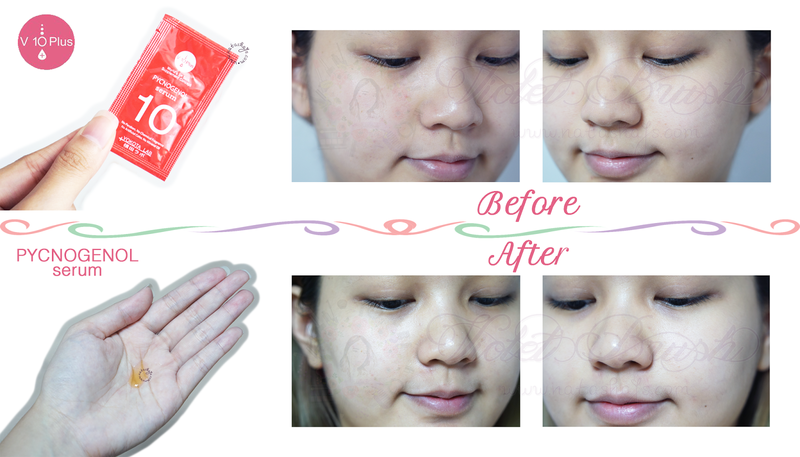 Instead, I feel that my skin got brighter after about two weeks (two sachets used). But again, my sensitive skin came knocking so while my face got brighter, I also experienced some redness on my cheeks. I originally don't have very large pores so in terms of minimizing the pores, I can't see any difference. I felt that I got less blackheads, though. I tried Pycnogenol Serum next. 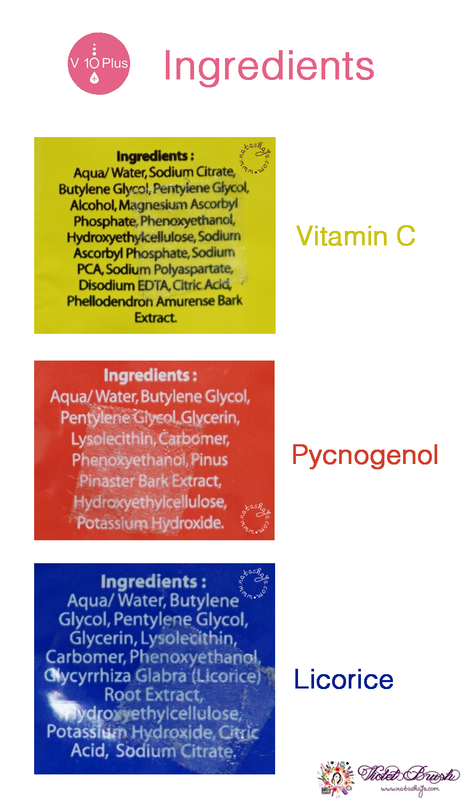 Out of the three, Pycnogenol Serum has the thickest texture and the most distinct color. It still somehow smells like medicine but not as strong as the Vitamin C Serum. After two weeks of usage, I noticed that the redness on my skin were reduced and my skin looked more glowing. I got a few acne the next day after I stopped the usage, though. Well, I think that's the anti-oxidant working on my skin. Last but not least, I tried the Licorice Serum. Licorice Serum has light texture similar with Vitamin C Serum but a tiny bit thicker. Thankfully, this one almost smells like nothing. Licorice Serum is meant to treat skin irritation and inflammation, and I'm glad I used it last. If you zoom in to the before photos, you can see a few acne on my nose area after using the Pycnogenol Serum. Licorice Serum helped to heal the acne pretty fast without any scars. However, I'm kinda disappointed that Licorice Serum seemed to trigger the appearance of blackheads. 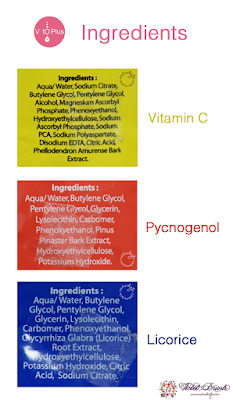 My overall conclusion is, there is a purpose behind the reason on why these serums are grouped and sold in a package. These serums really complement each other and I can't wait to try using these three serums altogether. Let me know if you want an update on the results after I tried! I would like to try either the Whitening Series or Hydrating Series.